Phase Tech Electrical is a full service electrical contracting company dedicated to offering prompt & professional service. 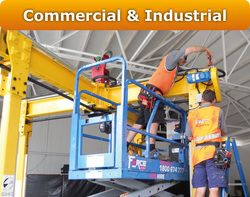 We pride ourselves on our quality workmanship & commitment to safe work practices. We have over 15 years experience working on a wide range of domestic, commercial & industrial electrical & data installations. Phase Tech Electrical is an environmentally aware company. We support sustainable living & seek to provide the latest in energy efficient electrical solutions. Phase Tech Electrical (QLD) Pty Ltd atf Griffin Family Trust. ABN 52 907 576 066. Qld Electrical Contractor Licence # 72370. ​NECA Membership # Q0721. Clean Energy Council Accreditation # A7662292. Refrigerant Handling Licence # L077664.